A Ring is a list of points such that the starting point and ending point are the same (forming a closed shape). The order the you define the points that make up a Ring - known as Ring Orientation - is significant, for various data formats (including SQL Server's Geography type) imply special meaning for rings that are defined in a clockwise manner as opposed to a counter-clockwise manner. Given a list of points with no additional context, it can be difficult to determine the Ring Orientation being used. For example, suppose that you have a generic list of points that represent the boundary of a postal code, and that you wish to use these points in order to construct a Polygon instance using the SqlGeography type. 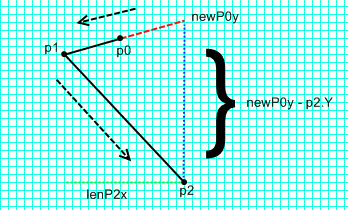 SqlGeography happens to use "Left-handed" ordering, so that as an observer walks along the set of points in the order defined, the "inside" of the polygon is always to their left. This also implies that the exterior ring of a Polygon is defined in a counter-clockwise manner. If you try to define a polygon with an area greater than a single hemisphere (this is a nice way to say "if you screw up and use the wrong orientation"), then the SqlGeography type will throw an exception. So, aside from using Try-Catch, what can you do? While researching solutions to this problem, I stumbled upon a paper entitled "A Winding Number and Point-in-Polygon Algorithm" from the Colorado State University. It turns out that a simple algorithm with O(n) complexity can be used to determine if a point is within a Polygon, and a side effect also provides the Ring Orientation. The key to this algorithm is determining the trend of the ring at each crossing of an axis. I've actually written (and posted) several versions of this algorithm, each time discovering some edge case exception that would cause me to take down the post and rewrite the algorithm. I believe the code below works for all simple polygons on a Cartesian coordinate system (read: I have more testing to see if this will work with an ellipsoidal model, like SqlGeography). Note: The following code is generic in nature, and as such, I've defined my own Point structure instead of using a SqlGeometry or SqlGeography, etc. In this, the eighth part in a series on the new Spatial Data types in SQL Server 2008, I'll step away from the database and do a little spatial coding using .NET. Up to this point in the series, I have demonstrated a lot of interesting (?) things that you can do with the new Spatial data types (Geometry and Geography) in SQL Server 2008. You might be thinking, "That's swell, and all, but I wish I could do some of that stuff without needing to be tethered to a database." Well, you know what? You can! A new feature that was included with the first Release Candidate (RC0) is the Builder API. This is a collection of interfaces and classes that helps you to construct spatial types by specifying one point at a time until all points have been added. The Builder API is not only useful for creating new instances of spatial data, but also for consuming existing instances one point at a time (maybe to convert an instance into another format). Documentation is light at the moment, so I'm still trying to grok exactly how to best utilize it. My goal was to parse the data, and then create a new SqlGeography instance for each zip code. (Note: SqlGeography is the .NET class name that T-SQL refers to simply as Geography). The SqlGeographyBuilder class proved to be perfect for accomplishing this task. At its core, the SqlGeographyBuilder implements the IGeographySink interface. 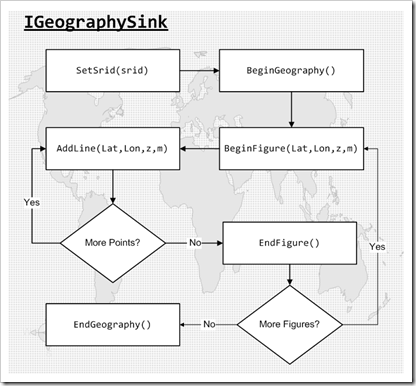 If you wanted to consume an existing SqlGeography instance, you could implement IGeographySink in your own class, and then invoke the SqlGeography's Populate() instance method, passing in your object as the parameter. The Populate() method takes care of calling the appropriate IGeographySink methods within your class. After EndGeography() has been invoked, the new instance is available via the ConstructedGeography property of the SqlGeographyBuilder class. Simple enough, right? Yeah, I'm still a little lost myself... But, here's some code to help demonstrate what's going on! The very first line happens to contain an identifier (maps to a second file that lists the actual USPS zip code). The coordinate listed in the first line is not actually part of the boundary, but rather appears to be the population center of that area. The actual boundary begins with the second line, and continues until you encounter the "END". Also, in case you couldn't tell, coordinates in this data are in Longitude-Latitude order. Since a Zip Code is a polygon, and since we are working with SqlGeography, we must be aware of ring ordering. That is, the exterior ring of a polygon must be defined in a counter-clockwise order so that as you "walk the ring", the interior is always to your left. 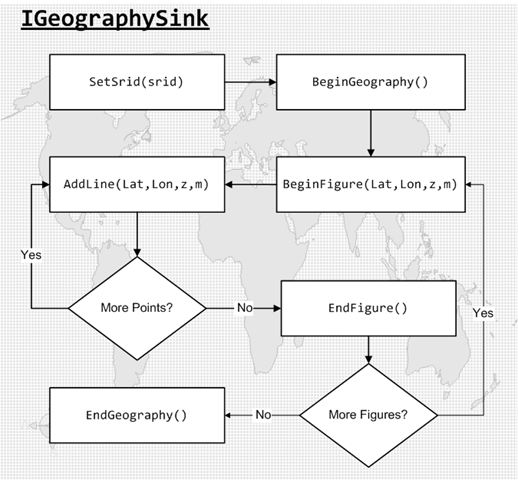 If you reverse the order, then SqlGeography assumes that you're trying to define a polygon containing the entire world except for the small area inside of the polygon. Well, in this case, the order of the points of the Zip Code boundary is defined in clockwise order... so, we must be aware of this and call into the SqlGeographyBuilder in the opposite order (so the last point defined in the ASCII data is the first point used while building our new instance). To accomplish this, I simply parse the Lat/Long coordinates as "double" types, and then push them onto a stack. Then, I pop the stack and call into the Builder API with each point. At the end, I obtain the new SqlGeography instance from the ConstructedGeography property.